This concept uniform set for our National League Brewers, heavily influenced by the American Association club, was designed by Peter Melling, who posts under the handle "SFGiants58" on the sportslogos.net boards. 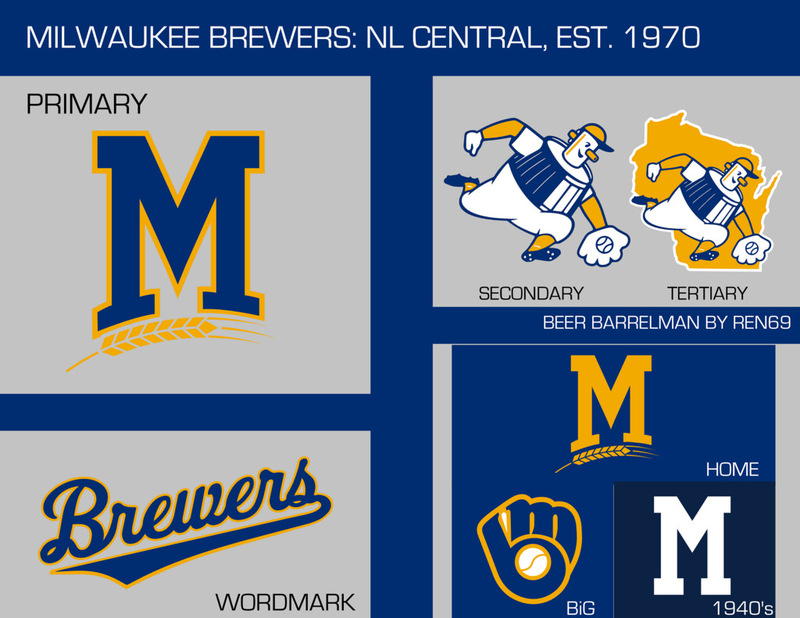 This identity for the Brewers takes elements from the history of the MLB club and the history of baseball in Milwaukee (the American Association Brewers and their affiliation with the future Milwaukee Braves), and incorporates them into a cohesive identity that balances both modernity and vintage charm. 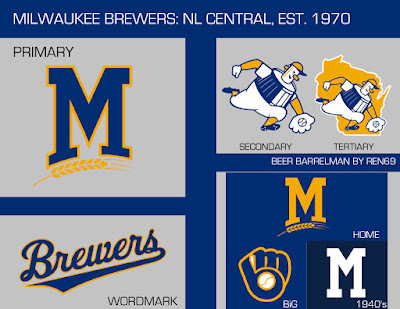 The throwbacks/fauxbacks also aid this goal, as they carry across a visual continuity of script and logo design with references to various points of Milwaukee's baseball history (i.e. the [Ball in Glove], pinstripes, the classic script, and the Braves affiliation). First up, the logos. There are two obvious references to the American Association club; a throwback block "M" cap logo and Brews mascot Owgust as a secondary logo and sleeve patch (this update originally created by user "Ren69"). There's a third callback you might not recognize; Melling's wordmark borrows its "tail" from the 1940s Bill Veeck-era uniforms. The uniforms themselves are straightforward and clean. I'm not a big fan of the barley-stalk stripes. Simple blue piping would look better to me, but I tend to be something of a traditionalist. On the other hand, I love the Owgust sleeve patches. 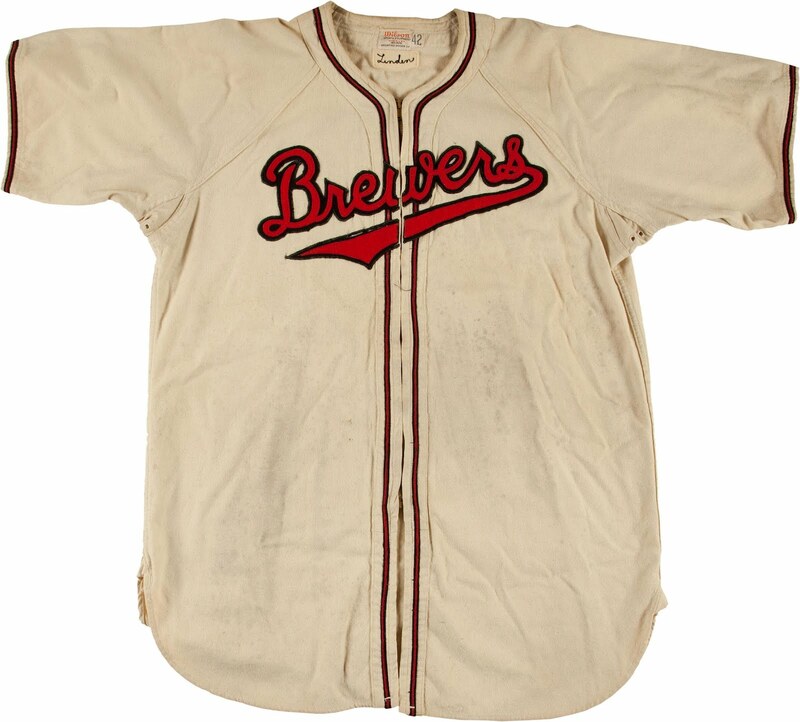 I've long thought it a shame that he never made it to the Brews' uniforms (although he was featured on dugout jackets in the 1940s). This version, chasing down the ball, is well-balanced for a sleeve patch. Melling also created two alternate jerseys, one royal blue and one athletic gold. Finally, and most interesting, are the two throwback uniforms to be included in the rotation. One is a throwback to the early 1990s, and the other an overt nod to our Brews. 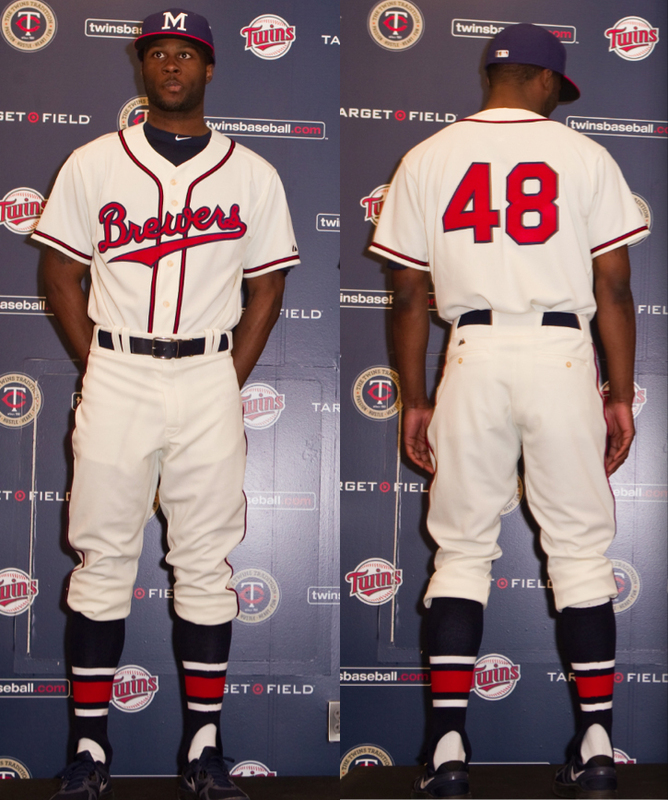 The other throwback is a recreation of the 1948 American Association Brewers' home uniform, which corrects some minor inaccuracies of the 2013 throwback. The cap logo now looks more like the actual cap logo, and the jersey now has raglan sleeves (which required me to adjust the template) and a zipper front. A navy/red version of Ren's Ogwust rendering has been added to the sleeve to help all of the uniforms tie in with a visual continuity, namely a script front with an Owgust/Beer Barrelman sleeve and an "M/MB" cap logo. 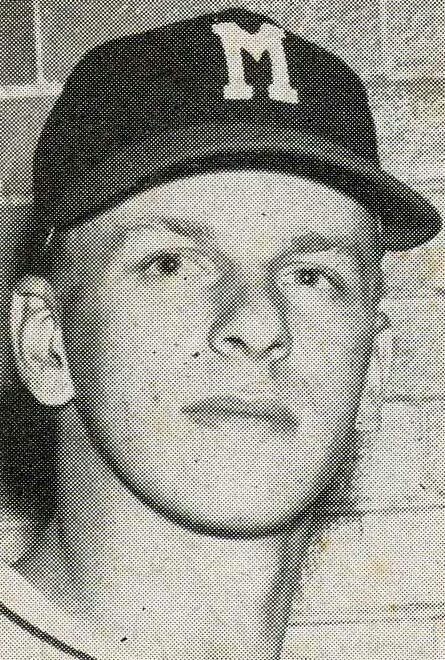 With the news that GM Doug Melvin was stepping aside, it's a new era for baseball in Milwaukee. The perfect time for the Brewers to freshen up their look, and they would do well to look at Melling's concept for inspiration.